I decided to experiment a bit with some of my leftover Sweetened Condensed Coconut Milk. 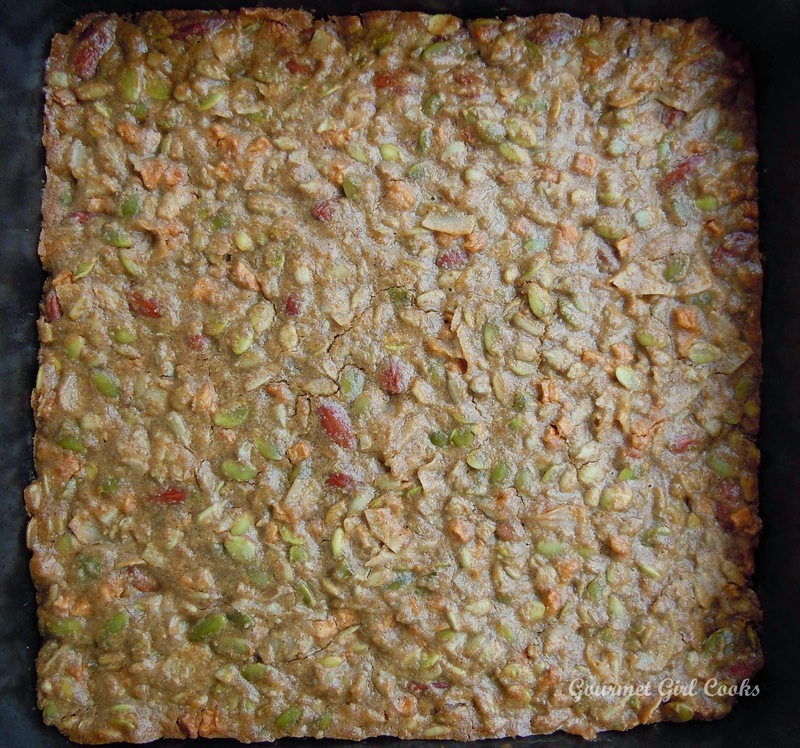 I wanted to make "Grainless-ola Bars" (granola bars without grains). 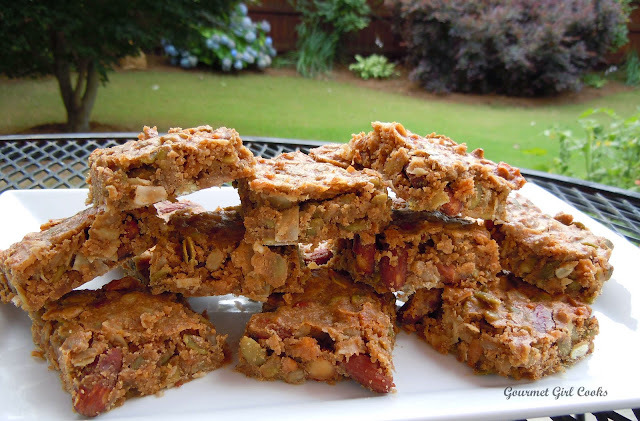 In the past, I've made "Seedy Power Bars" which also use my Sweetened Condensed Coconut Milk (made with Swerve). I wanted to experiment a bit with a slightly different bar recipe. 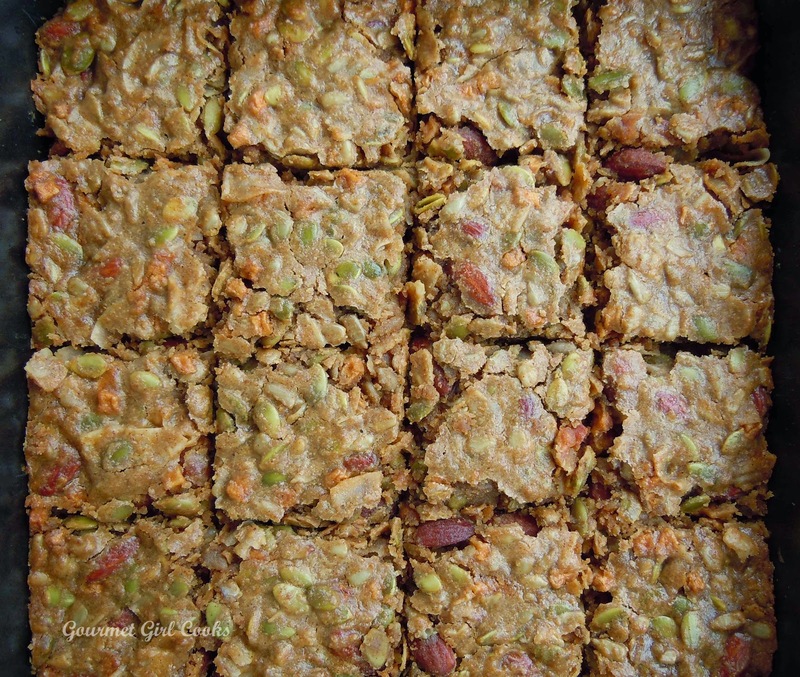 I like to use the sugar free sweetened condensed coconut milk as the "sweetened glue" that replaces honey used in many traditional granola type bars. The seedy power bars that I've made before have dried unsweetened blueberries in them as well as dark chocolate. 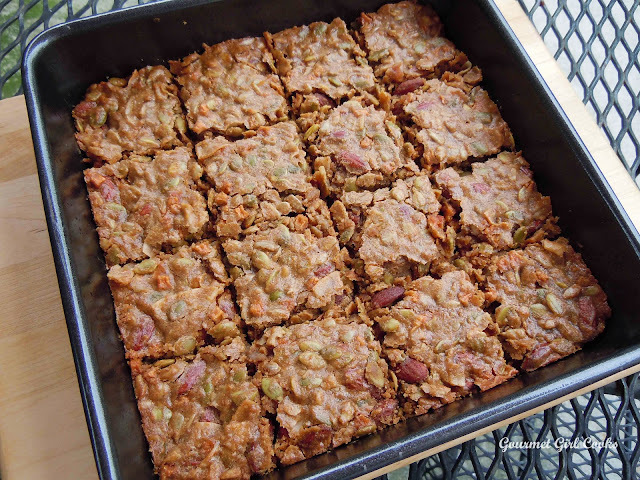 I decided to omit the chocolate this time and use dried no sugar-added diced apples (by Bob's Red Mill) in place of the blueberries and chocolate for a little additional natural sweetness (I only used 1/4 cup of apples to make 16 bars). This adds only 11 grams of sugar to the entire pan of bars, or less that 1 gram of sugar each. The net carb count for each of the Grainless-ola Bars (when cut into 16 bars) contain about 3 grams of net carbs per bar (3.125). If you cut them into 12 larger bars, they would contain about 4 grams of net carbs per bar (4.166). I rarely calculate the carbs on my meals any more because I have eaten this way for almost a year now (wheat and grain free), and after a while you know the drill. 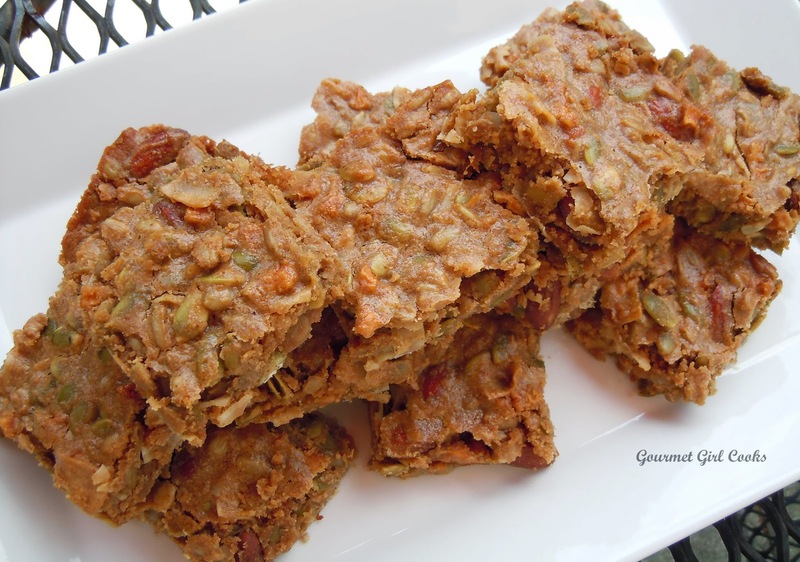 But, since regular granola bars are traditionally loaded with carbs and sugar, I thought I'd give you an approximate idea of what these contain. These bars contain almond butter (you could also substitute peanut butter)...so they should be kept refrigerated to keep them from getting too soft (particularly in the warmer weather). I snapped a few photos below for you to see as well as the recipe. Enjoy! Preheat oven to 275 degrees F. Heat sweetened condensed coconut milk in a small saucepan until warm; add almond butter and stir until thoroughly melted and mixed in; stir in maple extract and optional cinnamon and remove from heat. In a medium bowl, place remaining ingredients (except for optional additional Swerve or sweetener). Stir in the warm condensed milk/almond butter mixture, mixing until everything is well coated. Taste for sweetness and add additional sweetener, if necessary or desired. Press evenly, using a rubber spatula, into a lightly greased nonstick 9 x 9" baking pan. Bake at 275 degrees F for 30 minutes, then reduce heat to 250 degrees F and bake an additional 30 to 35 minutes. If you prefer your bars more browned, increase the baking time a few minutes. Remove from oven and let cool completely. Cut into 16 bars (or 12 larger bars). 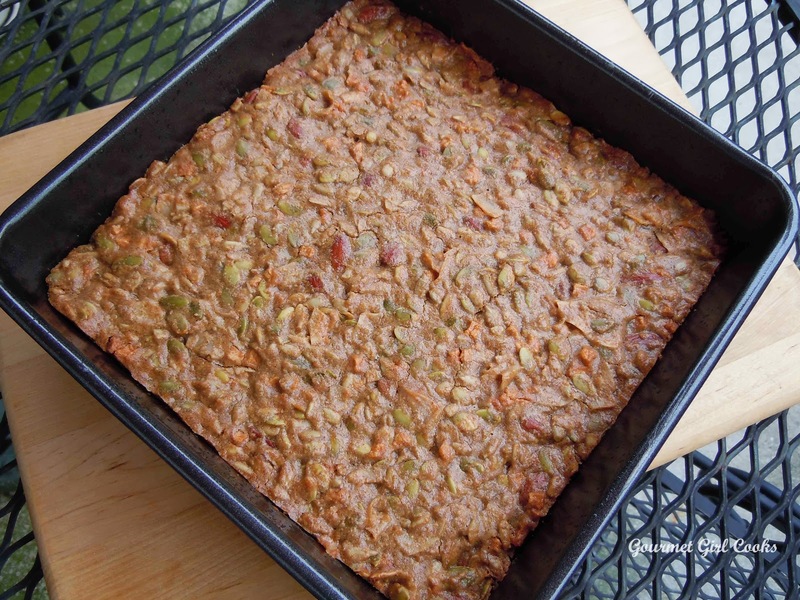 Place pan of cut bars in the refrigerator for about 1 hour to completely set before removing from pan. Keep covered and refrigerated to keep firm and fresh. **Note: This recipe uses about 3 cups of "nuts/seeds/fruits/etc." 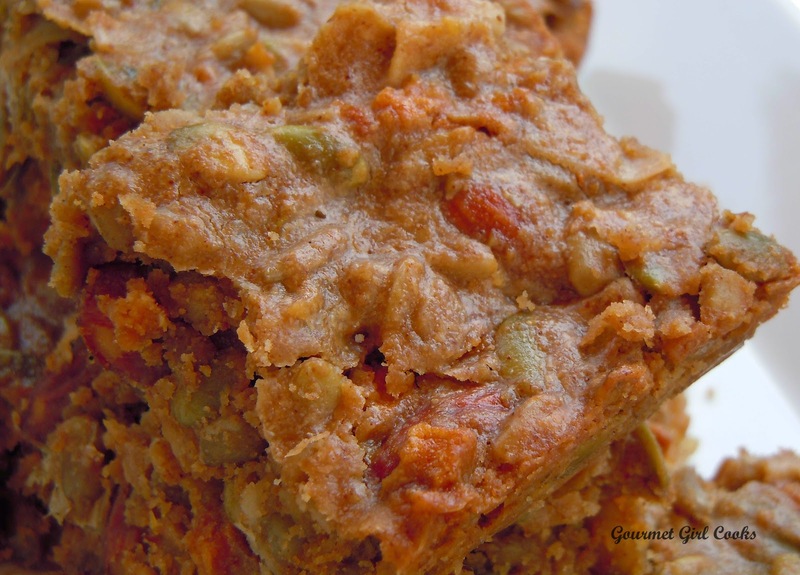 mixed with 3/4 cup of Sweetened Condensed Coconut Milk. You can easily substitute or replace any of the bar's ingredients if you don't like them or have them available -- just mix together about the same amount of your favorite ingredients. 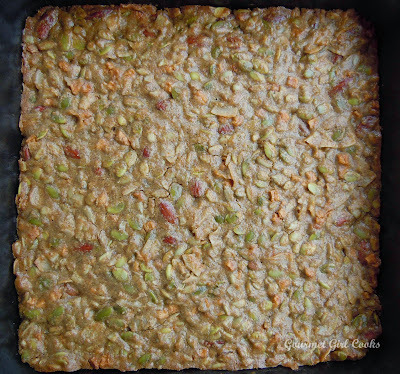 To make a larger batch using a 9 x 13" pan, use 6 cups of mixed seeds, nuts, etc. mixed with 1-1/2 cups of the Sweetened Condensed Coconut Milk. When I store them in the refrigerator, I usually place a layer of parchment paper in between the layers when I stack the bars to keep them from sticking to each other. I love all of your recipes and am going to attempt a wheat-free diet. I have not found much info about use of peanut butter or honey and wonder without reading the entire book yet what your take is on using them to bake etc. I cooked the milk last night so I'd be ready to go this morning for the granola bars. Two thumbs up! I'll use the rest of the milk for the lemon version of your pie this weekend. Happy 4th & enjoy your time off! GG, I made these last night and they turned out great, enjoyed them this morning with my delicious coffee. I added some chia seeds for extra fiber(lowers carb count) and I added one heaping Tb. of coarsely ground coffee. These additions rendered this bar crunchy. Next project will be something with lemons, you recipes of course! GG, I have a feeling that you are not in love with chia seeds, there is a flavor associated with it that is off putting, I found after many tries making puddings, that they are really good when one adds HAZEL NUT FLAVORING. It makes all the difference! I eat them as often as I can to balance the fat intake. (just as olive oil does),important when consuming cheeses, meats and eggs! GG, it was entirely my own fault ! Where you suggested as optional to use the 3-4 Tb of swerve, well I took that option, but that is how one learns. 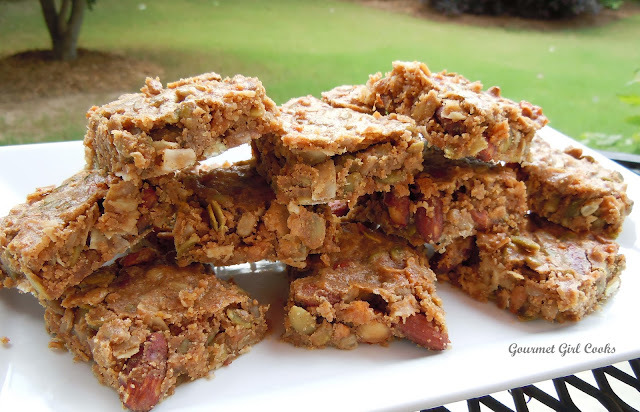 I wanted to tell you that the grainless granola bars taste even better today as do the magical cookie bars, which I also sprinkled with lots of ground coffe, they. taste like a Mocha bars. fantastic. Now I have to make my own Kahlua because of the sugar! As you can tell I am loving coffee. I use ground coffee, never got used to the taste of freeze or instant coffee because I drink my coffee black, no sugar! If I get coffee away from home I sometimes use cream to mask the bitterness or flavor . You also would not get the crunch with instant coffee. My mother was as I a total fanatic about coffee. She never used a coffee maker but poured the (not boiling) water directly on the coffee grinds , and then used a sieve to pour it through! She called machine made coffee*castrated*, yes indeed she did!LOL. And I do the same thing and I have three beautiful coffee makers. I just use them for company! The best coffee I have found is in Switzerland, where I lived for a while and in Germany. It does not get bitter. The acid also is removed, it is so smooth and never affects the stomach. And I married a man that does not like coffee-unbelievable! I used the French press when I lived in Paris, but I found the cleaning of the glass jar and the inserts tedious, it looks interesting but my method suits me better. I also tended to break the glass jar. When I go out I love the Starbuch medium roast at home I like the Gevalia line of coffee now easily available. They used to send it to me. In Paris I just had to drink Café au lait, because the roasts were so dark and bitter sort of went well with the Gauloise cigarettes. When I went home to visit my mother in Germany I looked forward to the coffee and the *broetchen* from the bakery, better than even the baguettes in France. I was a very poor student in Paris and could not afford to spend much money on food, so when I was broke I shared a bagette with my friend (equally poor) and we stuffed it with chocolate and that was surprisingly delicious, it was especially good when we could add butter to the bread. The American girls studying at the Sorbonne were sent by wealthy parents, the *au pair* students were usually from England and Germany. How I miss those days when the world was so different!